Startup Weekend Detroit is March 27, 28 & 29 at the Compuware World Headquarters in downtown Detroit. Startup Weekend Detroit from Shannon Paul on Vimeo. This is a fact that we in Black America need to realize.!!!! self-education will make you a fortune." While taking a morning walk along the Vegas strip it occurred to me that Las Vegas is a lot like life. It offers a lot of everything-both the good and bad. Both the soul nourishing and the soul crushing. You can find what you want depending on what you are looking for and focusing on. You can focus on the negative things that bring you down or you can focus on the dancing fountains at the Bellagio, the stone carvings at the Venetian, the beautiful architecture of the Wynn hotel, the countless art galleries, and the genius of my favorite entertainer Danny Gans. You can find desperation or inspiration. It just depends what you are looking for. With all the negative news lately I've found myself wanting to be inspired more than ever. So one night while I was sitting in my hotel room watching CNN, not inspired at all, I had a thought that I should go see a show and be inspired. I had never gone to a show by myself. I went down to the ticket office and told them I want to be inspired. They suggested a few shows and I decided on Jersey Boys. Boy was I inspired. It was amazing. I realized that you can’t always wait for inspiring moments to come to you. You have to find them. This past wednesday night Tim Tebow, the quarterback for the Florida Gators, was speaking at a local church in our town. I had a million things going on and a million reasons not to go but I went and took my son with me. During his talk Tim said that he could just share football stories and talk about winning the national championship and the Heisman trophy or he could talk about what really matters. Faith. He talked about writing John 3:16 under his eyes during the national championship game and how 90 million people searched it on Google as a result. I, along with the other 900 people that were there that night, were glad we stopped the treadmill of life for a brief time to be inspired. The world is full of so much negativity and pain right now but it is also full of so many amazing opportunities to be inspired. Inspiration is everywhere and I want to encourage you to seek it out and find it. Make time for it. You need it more than you realize. Rent and watch inspirational movies. (Slumdog Millionaire) Play your favorite song. Read inspirational books. Enjoy more sun rises and sunsets. Watch American Idol (just mute Simon). Visit an art gallery. Go see a play or concert. Attend an energizing Sunday service. Go see a high school sports event. Whatever inspires you, seek it out and make it a part of you. Be inspired. Where do you find inspiration? Share your comments on my blog here. "Successful people are always looking for opportunities to help others. Unsuccessful people are always asking, 'What's in it for me?'" The 2009 year is moving along rapidly! Please take this brief moment to update your NBDPA profile, join one of BDPA's chapters or renew your membership with us. To participate in our next conference, contact our national office at 1.800.727.BDPA (2372) to exhibit, present a technical paper, and pre-register. The National BDPA Technology Conference will convene in Raleigh's new Convention Center, Raleigh, North Carolina from August 5-9, 2009. Click here to update profiles with your newest or personal email account and mailing address. Join one of our chapters, or process current BDPA membership account renewals. Membership Meetings will be held every 3rd Thursday at Tech Town 6:30 - 8:30 PM. Refreshments will be served at the beginning of all meetings. In addition, when you attend the meetings, you will qualify for a discounted membership rate!! It's just our way of saying "thanks" for your participation. So remember to SAVE THE DATE -- Every 3rd Thursday is BDPA-Detroit Information Exchange Meeting! Come out and meet the 2009 Board, learn more about BDPA and it's benefits. We will also present to you the 2009 Goals and Objectives. As an added benefit, by attending this event you will be able to renew your membership or become a new member for $40.00. That's a $35 savings!!! . 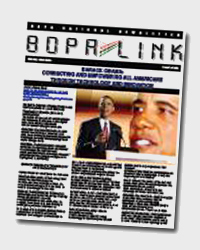 In the January 2009 issue of BDPA*LINK, "Obama Vows Not to Waver in America's Defense"
Where does our local Chapter or your committee fit in? bdpatoday ISSN 1946-1429 is published by BDPA and BDPA Chapters. Southfield-based Computer Data Inc. has announced a "Michigan Promise," a program designed to provide free computer training to the citizens of Michigan. This program is intended for highly motivated IT professionals that want to achieve their Cisco Certified Network Associate certification in a short period. "CCNA certification is an example of the type of high technology training that will help the state of Michigan develop a 21st Century economy and will leverage the state’s single best asset – the minds of its citizens." Computer Data president Jim Weyand said. "This certification was designed by Cisco to demonstrate the ability to implement and manage internetworks which are used by every business. These skills can be used to support networks across Michigan, across the United States and even across the world. This training can be the foundation for additional training that can lead to an extremely well-paid and rewarding career." Under the Promise Program, students should register and pay for a CCNA five-day class, either March 2-6 in the Lansing area or March 9-13 in Southfield. Pass your CCNA exam by June 30 and Computer Data will immediately refund your full class tuition of $3,295. The program is available for Michigan residents only. Computer Data officials say they've been headquartered in Michigan for more than 25 years, but that the majority of the company's Cisco training is now outside Michigan. Company officials say they'd like to increase the number of Cisco Certified technicians in Michigan. The brother and sister team of Jim Weyand and Kathy Murphy has owned and operated Computer Data, Inc. since 1983. Weyand said, "We grew up in Michigan, our parents lived here, our grandparents lived here, we were educated here and now our children are being educated here; we have founded and grown a business here and now, with the state facing unprecedented trouble, we want to give something back." Murphy continued, "When I travel to other states I often visit large Network Operations Centers that support global networks. There is no reason that Centers like these can’t be located in Michigan. A trained work force is the first step to attracting and growing these kinds of facilities in Michigan." Stardock this week has launched what it's calling its most innovative desktop utility application since the popular WindowBlinds -- Stardock Fences for Windows XP, Vista and Windows 7. The free application from Stardock clears desktop clutter and provides consistency and organization for groups of files on the desktop. Fences allows users to literally "draw" labeled shaded areas on the desktop which become movable & resizable "containers" for desktop icons. These groups arrange and hide the files on the computer's desktop solving the "constant mess" problem that has plagued the desktop since its inception. "This is easily the most innovative piece of software we've released since WindowBlinds, which considering the popularity of DeskScapes, ObjectDock, DesktopX and our other programs I think is saying a lot," said Stardock president and CEO Brad Wardell. To help solve another weak point of the desktop, the mere appearance of clutter, Fences offers a novel quick-hide feature. Users can double click the desktop and all of the icons will fade out. When users double click again the icons will return. Users can pick and choose which desktop icons hide when the feature is activated. Troy-based Altair Engineering Tuesday unveiled Personal PBS, a free turnkey application that leverages multi-core CPU technology to easily transform any desktop computer into a miniature computer farm or cluster system. For a nominal fee, Personal PBS also provides an easy upgrade path that enables customers to submit jobs from their personal desktop to back-end server systems running PBS Professional. Altair expects this new product to appeal to the open-source community, academia, small and medium-size businesses, and corporate clients who want to maximize local desktop performance. Personal PBS is available for download at no charge at www.personalpbs.com. Personal PBS leverages the additional compute capacity available in desktop computers with multi-core technology, greatly enhancing local computer efficiency and user experience and leading to higher productivity. With its intuitive drag-and-drop interface, Personal PBS is simple to use even for novice users. "Personal PBS is exciting because it provides a free, simple tool that allows our customers to increase productivity by leveraging available computing hardware," said Bill Nitzberg, chief technology officer of Altair's GridWorks unit. "And for PBS Professional customers with a high-performance backend cluster computer, users can seamlessly take advantage of both the backend cluster and their own desktops to do more faster." Personal PBS uses the same technology as the company's field-proven, commercial workload management solution -- PBS Professional -- to make real-time, on-the-fly adjustments based on processor and memory availability. As an intelligent application, Personal PBS allows users to continue to work on their desktops with no adverse effects while submitted jobs run in the background. In addition, customers can set job priorities and queue jobs to run at night or over the weekend. Personal PBS is the newest addition to Altair's GridWorks software suite, an industry-leading, on-demand computing software environment for grid and cluster computing, delivering improved performance, greater administrator control and reduced power costs. More at www.pbsgridworks.com or www.altair.com. It's the worst thing that can happen to a computer security vendor: This weekend, Moscow's Kaspersky Lab was hacked. A hacker, who identified himself only as Unu, said that he was able to break into a section of the company's brand-new U.S. support Web site by taking advantage of a flaw in the site's programming. On a conference call with reporters, Kaspersky Senior Research Engineer Roel Schouwenberg said that while he believes that the hacker did not access any customer information such as e-mail addresses, the hack would hurt the company's image. "This is not good for any company, and especially a company dealing with security," he said. "This should not have happened, and we are now doing everything within our power to do the forensics on this case and to prevent this from ever happening again." Schouwenberg blamed the breach on a Web programming flaw that was introduced in a Jan. 29 redesign of the support site, meaning that the bug was live on Kaspersky's site for about 10 days. "Something went wrong in our internal code reviewing process," he said. This flaw left Kaspersky's support site vulnerable to what's known as a SQL injection attack, which could have given the hacker access to about 2,500 customer e-mail addresses and to perhaps 25,000 product activation codes. Code on Kaspersky's Web site is typically subjected to an internal and external audit. Kaspersky has hired database expert David Litchfield to investigate the incident and expects to be able to report more on the hack within 24 hours, the company said. In an e-mail interview, Litchfield said that he has done this type of investigation before. "Typically there are no problems with investigations of this type. Of course, an attacker can attempt to hide their tracks, which makes things more difficult -- but by no means impossible." Unu notified Kaspersky of the bug via e-mail on Friday, and then one hour later hacked into the site. Kaspersky didn't see that e-mail until much later, but the company realized it had been hacked by around noon Eastern Time on Saturday, Schouwenberg said. Just 15 minutes later, Kaspersky reverted to an older version of its support site code, which did not contain the error. Kaspersky believes that Unu is from Romania, but is not seeking legal action in the case. Romanian authorities have limited resources and are unlikely to investigate the incident further, Schouwenberg said in an e-mail. There are more list out there today then Sushi bars in California. Things like Top 10 Best Hacking Tools or Top 10 Ways to take down Super Mutants in Fallout 3. I have wrote many of these type of list myself and certainly have read even more. In the world of networking, many times the answer to a problem is, "It Depends" For me, list help shorten that, dreaded it depends answer. And truthfully, if I can use a obscure tip to solve a problem, my alpha geek score goes up +24. When I sat down to write this blog, I thought I would write about tips I use so often, that they are stored in NVRAM and called from the buffer easily. This is not a list based upon a weighted value but just stuff I have picked up along the way to make my IT life easier and increase my fishing time. - "netsh interface tcp set global autotuning=disabled"
- "netsh interface tcp show global" check for the line that reads, "Receive Window Auto-Tuning Level" and make sure it says disabled. Tip 00x03: Here in my lab, I am rebuilding images all the time. A little Linux trick I learned at a user group meeting was to make sure I have /home in a separate partition. This simple but powerful trick allows me to reinstall the system or even change the entire distro without losing my data and personal settings. Just keep the "/home" partition intact and reinstall whatever I need to on "/". Whole lotta typin' going on there. How about increasing your geek status and do this same thing with a small tweak...add the -p.
Now open iTunes and there it is! Only nine tips?? What gives Jimmy Ray? The 10th tip is something we should always be sharing with each other. I am hoping that you will share your 10th tip on this blog! Do you have a timesaver, shortcut or just something cool? Bruce Allen is perhaps the world's best do-it-yourselfer. When he needed a supercomputer to crunch the results of gravitational-wave research, he built one with his colleagues at the University of Wisconsin-Milwaukee. That was in 1998, and since then he's built three more supercomputers, all in pursuit of actually observing gravitational waves -- they theoretically emanate from black holes orbiting each other and from exploding stars -- that have never been directly observed. His most recent supercomputer, a cluster of 1,680 machines with four cores each, is in Hanover, Germany. Essentially, it's a 6,720-CPU core processor that in the months after it was built was ranked number 58 in the world. "We filled our last row of racks recently, and we're number 79 on the current top 500 list now," says Allen, the director of the Max Planck Institute. He builds his own for several reasons, including that he thinks he gets more for his money when he does the work himself. "If you go to a company -- Dell or IBM -- and you say, 'I've got a $2 million budget, what can you sell me for that price?' you'll come back with a certain number of CPUs," he says. "If you then go and look at Pricewatch or some other place where you can find out how much the gear really costs, you find out that if you build something yourself with the same money you'll end up with two or three times the processing power." The problem is big-name companies have a lot of overhead comprised of layers of management and engineering. "They do sell good products, and you don't need to have any particular expertise to buy them," he says. "It's always been my experience that if I do it myself I get more bang for my buck." For instance, his first supercomputer was built from a Linux cluster of bargain 48 DEC Alpha Servers that had been discontinued, each with a single 300-MHz 64-bit AXP processor. "So I got a very good deal on them. I think the list price was $6,000 and I bought them after they were end-of-lifed for $800," Allen says. "The switch was a 3Com Superstack 100M bps Ethernet switch. I think it was a pair of them, each with 24 ports connected by a matrix cable." The servers were housed in a room slightly larger than a closet on particle board shelves bought at Home Depot. "It wasn't even racks because rack-mounted systems would have raised the price significantly," Allen says. The whole thing used about 200 watts of power, and the university facilities staff had to remove flaps from the air ducts feeding the room so they could dissipate the heat efficiently enough. The total cost was about $70,000 he got from the National Science Foundation (NSF). The grant was actually for eight high-end Sun workstations, but he spent it on the Linux cluster instead. "And they both laughed and said, 'Well, we're very, very happy. If it hadn't been successful, we wouldn't be saying that.' "
Another benefit of crafting his own is the control it gives. Using a shared supercomputer creates unwelcome delays, he says. At the Cal Tech center for supercomputer applications, for example, he had to batch his jobs and wait two days until it was his turn. Then if he'd made a one-character error in a submit file, for example, he'd have to redo it and his job would move to the back of the queue for another two-day wait. There were many such possibilities for setbacks. "Each of these things was a little inefficiency factor, maybe .8 or something like that. But there were six or eight or 10 of these things and all of those factors of .8; by the time you multiply them all together it was very difficult to actually get the work done," he says. Allen says he has no formal training in building supercomputers. Most of what he uses is Beowulf open source clustering technology that he felt his way through. "I don't think it takes particular expertise," he says. "Lots of people have set up Linux networks at home and any of those people with some money and some need for a compute cluster could build one, I think." The most complicated thing about building a cluster is the networking, and the trickiest part of that is automating configuration of the boxes. When he started out on the 48-node cluster in 1998, he did each operation by hand on each server. "You quickly discover if it takes you five minutes per computer to do something and you have to do it 48 times an entire morning or afternoon goes by and what's more you make mistakes," he says. "So the name of the game is setting up automated systems to do things, like automated systems for installing operating systems and cloning machines and so forth. But there's lots of public domain tools out there for doing that." Allen says he regards the supercomputers as a tool for observing gravitational waves, which he regards as just another tool for finding out more about the universe. "For example, orbiting pairs of black holes don't emit any light, no optical, no radio, no X-rays," Allen says. "But they do emit gravitational waves so we'll be able to study such things by their gravitational wave emission. And who knows what else we'll discover? That's really our secret hope, that we'll find something really new." Twitter can be a valuable tool for gathering collective intelligence from experts in the technology industry. The challenge is selecting the right people to follow. Here are the top 10. For new users on Twitter, the toughest thing to figure out is who to follow. And since Twitter is a real-time stream of 140-character updates from people whose thoughts and opinions matter to you, the issue of who to follow is what makes Twitter either a time-waster or a useful tool for gathering intelligence. With that in mind, I’ve put together a list of the top techies worth following on Twitter. You can also find me on Twitter at http://twitter.com/jasonhiner. My list isn’t based on the most famous tech personalities who have Twitter accounts or the ones who have the most Twitter followers. Instead, I’ve looked for the technology thought leaders who post the most useful information–links, news, tips, inside information, and perspectives on current events. I also looked for techies whose Twitter streams weren’t filled with too much chaff–off topic thoughts, lots of short replies, and detailed reports on what they had for lunch. 1. Harry McCracken (Editor of Technologizer): Former PC World editor has rapidly–and successfully– refashioned himself as a Web journalist; he writes early and often on a wide variety of tech subjects and no techie on Twitter has a better wheat-to-chaff ratio than Harry. That’s why he made No. 1. Here are another 20 techies that didn’t quite make the top 10 but are still worth following. What do you think about my top 10? Who would you put in your top 10? Join the discussion. Is Twitter the most important development on the Web in 2008? It seems like every time you turn on the television or read the paper more companies are laying off more people. If you are like me, the bad news feels like someone punched you in the stomach. You feel for the people who are losing their job and you grow even more concerned about our economy and future. It's times likes these where we have to be mindful of the collective “doom and gloom” and not let it seep into our mindset. We have to remind ourselves that the media reports the negative news, not the positive news. They announce that a company is laying off 3,000 employees but they don’t say that 300,000 people are still employed. They don’t say that millions of people are still working every day and contributing to the global economy. We have to remember that even if the unemployment rate approaches 10% that still means that we have 90% employment. There are still a whole lot of employed people who are making money, eating at restaurants, paying for college, fueling up their cars, buying houses, and purchasing every day products. Imagine if the headline read "Employment rate closing in on 92%" rather than saying "The Unemployment rate is soaring to 8%." Two different headlines and two very different perspectives, thoughts and emotions. Instead of listening to all the negative voices we have to focus on our choices. The choice to be optimistic or pessimistic. The choice to focus on 92% employment or 8% unemployment. The choice to stay positive in the face of all the negative news. And the choice to take positive actions to deal with the current situation. But what if you are someone who has to deal with a layoff first hand? Perhaps you are in a company that is dealing with layoffs. Perhaps you have to do the layoffs. Or worse, perhaps you are the one who has been or is being laid off. The reality of the situation is that layoffs are happening and you might be wondering how to deal with it. 1. You are a leader or manager having to do the layoffs. 2. You are someone who is staying in a company where layoffs are happening. 3. If you are someone who has been or is being laid off. There is certainly no positive spin on having to fire someone or be fired. But there are ways to turn the bad and use it for good. There are ways to maintain trust, integrity and optimism. Having been laid off during the dot.com crash a number of years ago I know this situation well and hopefully I can share some lessons from the most fearful and uncertain time in my life. Until next week, stop listening to the negative voices and focus on your positive choices.